Brigitte Vola mailed us this photo: "This is a picture of two best friends on finals night 2003 at the Citrus Bowl in Orlando, Fla. 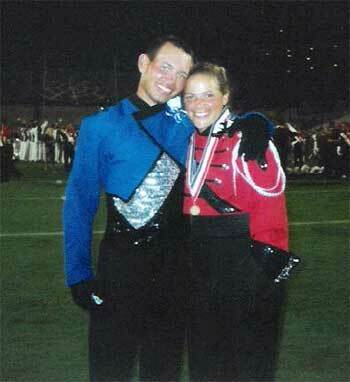 The Blue Devils had just been crowned 11-time World Champions, and the corps had been dismissed. T.J. is the Blue Devil in the picture. He is my best friend and we have known each other for about four years now. "My name is Brigitte and I am the Boston Crusader. We both aged out this year. In fact, I am shown in an age-out interview on the PBS Broadcast of the 2003 DCI World Championships -- at least, so I'm told. I haven't had the chance to see it yet! "It was great to age out in Orlando because we are both from central Florida so it was nice to be "home" where family and friends could be there. I marched with the Crusaders in 2002 as well, and T.J. was a Crusader for the 2001 and 2002 seasons before aging out with the Blue Devils this year." Thanks Brigitte!